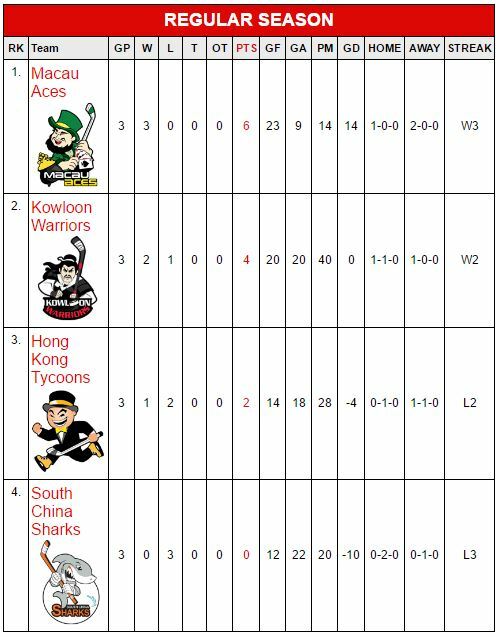 HONG KONG—In Round 3 matches, the teams have now become coordinated units, match fitness and sharpness have returned, resulting in 2 top-level games on Thursday Oct 20. In a fast and furious game, Bradley Holmes opened the scoring for Sharks in the 1st minute but Aces hit back mid-way through the session with strikes by Marcus Taeck and Ryan Wong. Holmes got a second after 11 minutes to draw level but Taeck pushed Aces back into a 3-2 lead at the turnaround. Neither team could add to their scores in the 2nd session, however, several players were sin binned for minor offenses. Goal scoring activities progressed again after ice-cleaning with Yannick Wong increasing the gap to 4-2 for Aces, but Sharks showed their teeth fighting back to 4-4 with hits by Jamie Stark and Blake Steele. As the game progressed Aces edged ahead 5-4 with a 2nd Wong goal and Stefan Northman cashed in with a solo break in the last minute as Sharks threw everything into attack. Final result was 6-4 to Aces to take them to the top of the Standings on 6 points. It was a super competitive and even encounter, with Sharks still at the bottom of the standings but in this match showed some of their usual flare, a huge improvement over their previous lackluster performances. Jordan So is regaining his match fitness and although he did not score, he played a forceful role logging up 4 assists. In the 2nd match Warriors against Tycoons was a second hum-dinger of a game, it got a bit rough at times particularly towards the end of the game, but it was a high quality encounter with lots of attacking and end to end play. Session 1 brought 1 goal each with Tycoons scoring first through Lucas Eshleman and Jake McDonnell equalizing in the 11th minute. The next 2 sessions were all action both on the pitch and in the sin bin. The fun started with Jim Fanstone putting Tycoons into a 2-1 lead and then Eshleman and Fanstone scored after McDonnell had secured his second of the match to leave Tycoons in their familiar place in front at 4-2. But Warriors could not accept this and hit back to even the score at 4-4 with strikes by Eric McKenna and Franc Lockyer. Devin Welsh had a desperate 2nd session with a 4-minute sin bin visit starting in the 10th minute and then immediately after returning to the ice, was rewarded with another 10-minute ban together with Jim Fanstone for misconduct. In the 3rd session after early even play, Warriors converted 3 goals in the 7th, 10th and 11th minutes with Simon Ferguson getting on the scoresheet with additional goals for McKenna and McDonnell. At 7-4 against, this was now unfamiliar territory for Tycoons. Eshleman made another strike in the 12th minute for 7-5 but McDonnell added his 4th of the evening to make it a memorable victory for Warriors, 8-5. The matches for Round 4 of the CIHL on Nov 3 will be Aces to Warriors and Tycoons to Sharks.